Wondering if these are steamed buns, not pan-fried buns? They are pan-fried buns (also known as shengjianbao 生煎包). Not joking, it’s real. Back then when I was up to make these buns and planned to post the recipe on my Chinese food blog, just in time I remembered that some fans had asked me how to wrap and pleat a bun. So I took a video while I did the pleating of a bun. Then I cooked the buns in a frying pan instead of a steamer. The shengjianbao I tried before in a shanghainese restaurant were round and flat without any pleatings, that looked quite different from mine posted here. Since then, I’ve seen more and more of these pleated buns being served in restaurants. The buns are lined up in a nice and hot oily pan and cooked until the bottoms are very crispy. You might also like to sprinkle some finely chopped spring onions and white sesame seeds on top for garnish. That will make your buns look more attractive. The texture of these buns is soft and fluffy with a crispy bottom. I like to dip them in some soy sauce with black rice vinegar, whereas my husband likes to have them with extra chilli sauce. Whichever sauce you try, it won’t let you down. The buns taste very delicious on their own though. To prepare the fillings: Mix the pork mince with the seasonings. Stir towards only one direction. Add chives. Cover and chill in fridge for about 30 minutes. In a large mixing bowl, pour in water. Mix in yeast. Add sugar, salt and oil. Sift in flour. Use a spatula to combine all the ingredients. Knead into a smooth dough and the surface is not sticky. Transfer into a greased bowl, covered. Rest for 10 minutes. Transfer the dough onto a clean surface. Roll it into a long tube. Cut into 8 to 10 equal portions. Roll each portion into a ball shape. Flatten with your palm and roll each into a disc with a rolling pin. Wrap a spoonful filling inside, pinch the seam as the video shown below. Repeat this step to finish all the remaining dough disc. Cover and rest at room temperature for 10 minutes. Heat oil in a non-stick frying pan over medium-high heat. Place the buns in one single layer. Fry them for about 2 to 3 minutes. Pour in boiling water, up to 1½cm in depth. (Remark: Cook in batches if your pan is not large enough.) Cover and cook until the water starts to dry up. Remove the lid and continue to cook until the bottom of buns are golden brown. Serve immediately. You can replace with any vegetables you like, or skip it, only use meat. It’s no need to blanch the chives. Simply chop them finely and mix well with the pork. By doing so, the nutrients and all flavours are retained. It’s a great found by a lazy person, myself. 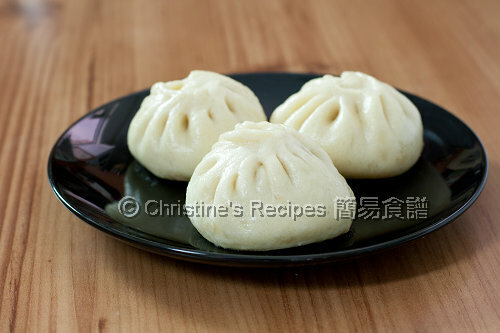 By adding boiling water to cook the buns with cover, you're very sure the pork inside will be cooked through. We have to cook until the water starts to dry up. Then remove the lid and continue to cook one to two more minutes or so, the bottom will become crisp. I've updated the recipe. Hope the instructions are clearer. Can you steam the buns instead of frying it? If so, how long would you steam it for? Yes, you can steam the buns in a wok or a steamer, over medium-high heat for about 12 to 15 minutes. You might take out a bun to see if it's cooked through or not. I am HUNGRY! These pork buns are fantastic, Christine. So kind of you to share this recipe. Bookmarked! why do we need to use yeast when we do not go through the process of rising the dough?? In Method 2 & 3, we let the dough rest for 10 minutes, it's proofing in fact. The yeast will do its job inside the dough. As we don't need to double the size of the buns, the resting time of 10 minutes at room temperature is enough. That's the texture we are looking for. hi. can i freeze this bun? do I need to cook before freeze? i saw your video about how to wrap the bun. it seem very easy to wrap. but when i wrap my buns, it turns so ugly. haha. I often cook the buns then freeze them. Whenever I need them， simply reheat them again. No worries. Practice makes perfect. Try several times, you'll get there. Very glad that you loved my recipes. For beef tendon, I've already published on this blog. Please use the search box on top and you'll get it. West Lake soup is in my cookbook. For others, I'll post to share if I make them. Yes, I've got several recipes of Chinese buns and Tiramisu. It's very handy and quick to find and get the recipes by using the search box on top of this blog. Thanks for the video!! I love these buns! These look like tasty little gifts, they are so nicely wrapped! Can I prepare the dough in the bread machine? Thanks for all the scrumptious recipes! Hi Christine, I ended up kneading the dough in the bread machine. It worked! =) Unfortunately, I didn't manage to make the bun wrapped up properly, so I ended up flattened the buns and fried them on both sides. I also sprinkled some sesame seeds on top. They were very tasty. I now have 6 flattened buns left. Can I wrap them up in parchment paper inside a freezer bag then place them in the freezer? Thanks for your tips! Practice makes things perfect. You'll get there very soon. I use to freeze the cooked buns and put them in a plastic bag. When I need them, just steam them in a wok and then I have hot and nice buns. Thank you so much for the recipe. My family (especially my mum in law) loves to order 生煎包 at Shanghai restaurants. It'll be super amazing to be able to make this at home! 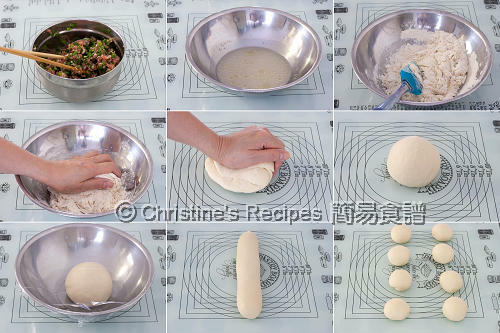 Do I need to let the dough rest and double up like the way of making "man-tou" or "qua-pao"? Yes, let the dough rest to double in size. Glad that you liked this bun recipe. It's quite versatile. You can use any fillings you like. Hi Christine,truly this my first time to know about pan fried bun..I like to make them familiar to me n my family.. These buns are so tasty with crispy bottoms. Give it a try. I think you'll like it. Hi Christine, I've made these 2X now. The recipe is so versatile for any kind of filling and the buns come out perfectly each time. Last night's version had minced Chinese mushroom, 5-spice, and an armload of kale from the garden (steamed, squeezed dry, then chopped fine). Delicious! Your recipes are wonderful for CBC'ers like myself. Thank you very much. Thanks for your feedback and your love of this steamed bun recipe. I love your idea of making the filling too. Very balanced and delicious. I have lived in Shanghai for about a year and a half and Sheng Jian are by far my favorite food here! Thank you for the recipe.... Now that I'm going back to the States, I can't wait to introduce my friends to these little treats!! Thanks for introducing my recipe. Happy cooking ! your recipes are so amazing, thank you, please keep on sharing. they never fail me and my family is so happy. So glad that you loved this recipe. I can't find real Shengjian pans. Do you know what they are called or where to find some. They look like large round cast iron with raised edges. They oftem have a wood cover. Any ideas? I know what you're looking for. It's very difficult to find that kind of large old-fashioned pan. Sorry, no idea. Did you expect some soup inside your buns like Xiao Lung Bao. It shouldn't be like that.